Experienced technical services from licensed, certified, skilled professionals. Your lightning and surge protection demands skilled design and engineering for maximum effectiveness. We offer free system design to ensure that each area of vulnerability is addressed appropriately. There are four main ways lightning enters structures: a direct strike, through wires or pipes that extend outside the structure, through the ground and through mid-air induction. Once in a structure, lightning can travel through the electrical, phone, plumbing, and radio/television reception systems. Lightning can also travel through any metal in concrete walls or flooring. 1 Is your project over budget? Are you looking for ways to cut costs without sacrificing protection? We offer the most cost effective lightning protection system available, and we can help you get back on budget without compromising protection quality. We furnish and install all labor, equipment and materials required to install lightning and surge protection to applicable codes and standards. All components and materials used in a complete Preventor installation are UL96A listed and Applied Research Labs listed, labeled, and field inspected. They are also certified to HBP-21 Manufacture Standards. Contact us for assistance in determining your risk from lightning and surge. 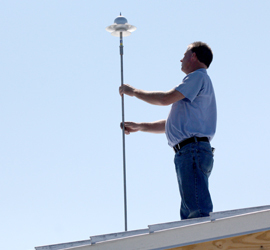 We offer free lightning protection surveys and free surge surveys. A professional assessment will help you determine the best way to protect your home from direct strikes and transient surge. Grounding is the basis of your entire protection system. Ensure that the grounding of your home is adequate and up to standards. Contact us to schedule ground testing services. Maintenance inspections include a thorough low resistance ground test report as part of the full inspection. This inspection tests connections and all parts of the Preventor as well as the ground system. You will receive a Certified Inspection and Maintenance Report which is filed with the manufacturer and a certificate of compliance. And our certified installers routinely do a visual check of existing systems when they are in the neighborhood. A check from the ground could reveal a problem with your home system. If we suspect any issues, we will contact you right away. See the result of a ground observation made while visiting another customer’s protected home in a Sarasota neighborhood. Has your old system been damaged or had parts been stolen? Exposed lightning rods and cables are often damaged by lightning. And theft is actually a common problem with traditional systems due to the value of copper. Since the old-style Faraday cage systems have tremendous amounts of exposed copper wire they are tempting and accessible to thieves. We can identify and replace missing and damaged parts that can leave you vulnerable. Contact us today and find out just how affordable and aesthetically pleasing a state of the art lightning protection for your home can be. We offer skilled installation, design and value engineering based on years of field experience. With over 100,000 installations world wide, this system is time tested and field proven. Florida Lightning Protection is a division of Windemuller Technical Services. Our company has over 25 years experience offering a complete range of electrical and technical services in the state of Florida.